Search engine marketing (SEM) is an umbrella term encompassing both SEO and paid search advertising. However, it is common to see people only interested in either SEO or paid search. Historically, research has shown that organic search engine results receive many more clicks than paid results. More recent research however shows that paid search results are starting to receive more clicks (though still does not receive the majority clicks). So which is a better investment for your website’s SEM campaign, SEO or paid search? Quick Recap – What is SEO? Search engine optimization (SEO) is the process of enhancing your website’s visibility in organic search results. The organic search results are those which appear beneath paid results. More information on SEO can be found here. One of the largest advantages of SEO is the sheer number of people you can reach. In 2016, it was reported that Google processes roughly 2 trillion searches on average each year. Since this 2016 figure represented a roughly 66% increase from 2012, it can be reasonably assumed that Google processes much more than the 2 trillion annual searches reported on two years ago. Since organic search result listings are responsible for over 50% of general website traffic, there’s a massive opportunity to reach a lot of people through SEO. SEO does not come without its downfalls. The primary detriment of SEO is its difficulty. Over 90% of the users generating those trillions of Google searches annually do not look past Google’s first page. If your website doesn’t rank on page 1, you are missing out on the vast majority of search engine traffic. Outranking competing websites currently listed in Google’s first page of organic results requires creating better content than your competitors, earning better quality links than your competitors, and optimizing your website’s technical performance. And even if you are putting in the hard work of consistently adding high value content to your website while consistently building high quality links, it can still take 6 months or longer to earn a precious page-1 ranking. And if you let your foot off the accelerator after earning your desired organic rank, you risk losing to your competitors and getting knocked off of page 1 again. SEO is like retirement savings. Only after you make consistent investments over a long period of time do you see results. Quick Recap – What is Paid Search Advertising? Paid search advertising is leveraging the paid search results which appear at the top of a Google search result page. The amount of money you spend on this type of SEM directly impacts when and where your website appears in paid search results. Whereas SEO results can take a lot of time and work to start seeing results, you can get your website to appear on Google’s first page in a much shorter amount of time. 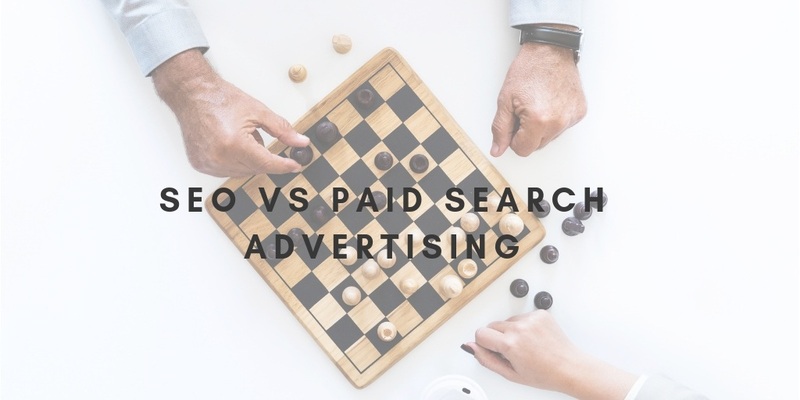 Since paid search advertising is much more pay to play, you don’t need to consistently build several quality links and website content (though SEO keyword optimization can improve your quality scores) to achieve page 1 positions. Additionally, through Google Ads, you have much more control over who sees your website in paid search listings. You can use demographics, website visit activity, specific keyword queries, and much more to define the types of people you want seeing your paid search listing. Paid search results don’t receive as many clicks as organic results (as noted earlier though, paid search clicks have been trending upward). So while you may be able to earn more qualified traffic by refining the audience seeing your paid search listing, the quantity will be lower relative to SEO. Also, where SEO’s difficulty comes in the form of content creation and link building, finding the right demographic to target for your paid search campaign can be difficult and require trial and error. It may take several months of testing and filtering to find the most fruitful audience to target. There’s also the fact that paid search requires you to spend money. You don’t need to spend any money to get your website to appear in Google’s organic search results, but your website will never appear in paid search results without spending money. Being truly competitive in paid search can sometimes require a significant investment each month. Which is Best – SEO or Paid Search? While some industries and websites may be a better fit for either SEO or PPC, both of these channels should be used to drive the best results. Maximizing an SEM campaign’s performance requires the proper usage of both SEO and paid search. Even though most search engine users click on organic results more often than paid results, a significant number of people still click on paid results. You can capture much more search engine traffic with both SEO and paid search. SEO and paid search are two crucial pieces of search engine marketing. Ignoring one of these can lead to a missed opportunity to generate website leads.